The Ljubljanica is a Slovenian river flowing through the southern part of the Ljubljana Basin. It originates near Vrhnika. After crossing the Ljubljana Marshes, it runs through the city of Ljubljana and it flows as a right tributary into the Sava River at the village of Podgrad. Logaščica stream, which partly involves the sinking systems of Rovte, Hotenjsko podolje and Logaško polje. South of Vrhnika, these sinking streams are joined underground by the rest aforementioned streams. At the edges of the Ljubljana Marshes, the sinking waters from the Rakitna originate, at first in Ponikve at Preserje and then in the karst spring at the town of Kamnik pod Krimom. Although the Ljubljanica river basin belongs to the Black Sea Basin, some streams from the Pivka Basin and the valley Hotenjsko podolje flow underground into the rivers Timava, Vipava and Idrijca, thus representing a bifurcation on the Black Sea/Adriatic watershed.In Podgrad, there is a confluence of three rivers: Ljubljanica, Sava and Kamniška Bistrica. Here, some 2000 years ago, the Romans built a fortress (Sava Fluvia); at the same site at the time. the stream Besnica flowed into the Sava River. In the 18th century, due to inland navigation of large ships, the Sava and the Ljubljanica were regulated, so the confluence was moved to Zalog (as mentioned in the chronicles by Janez Vajkard Valvasor). The Ljubljanica River, also known as the river of seven names, is abundant in water, as the water is collected from 1884 km2. The basin is mainly karstic; during floods the water builds up in the karst fields and does not drain quickly, while during droughts, the water percolates through the karst underground, which runs dry, while the low flow rates are very low. For instance, the Sava river (with a slightly larger basin area) at the confluence with the Ljubljanica, has about four times higher flood flows and almost ten times higher low flows.The Ljubljanica river is formed by many springs at the edges of the Ljubljana Marshes and several major tributaries, such as the Podlipščica, Borovniščica, Iška, Zidarjev graben, Iščica with the Želimeljščica and Gradaščica. 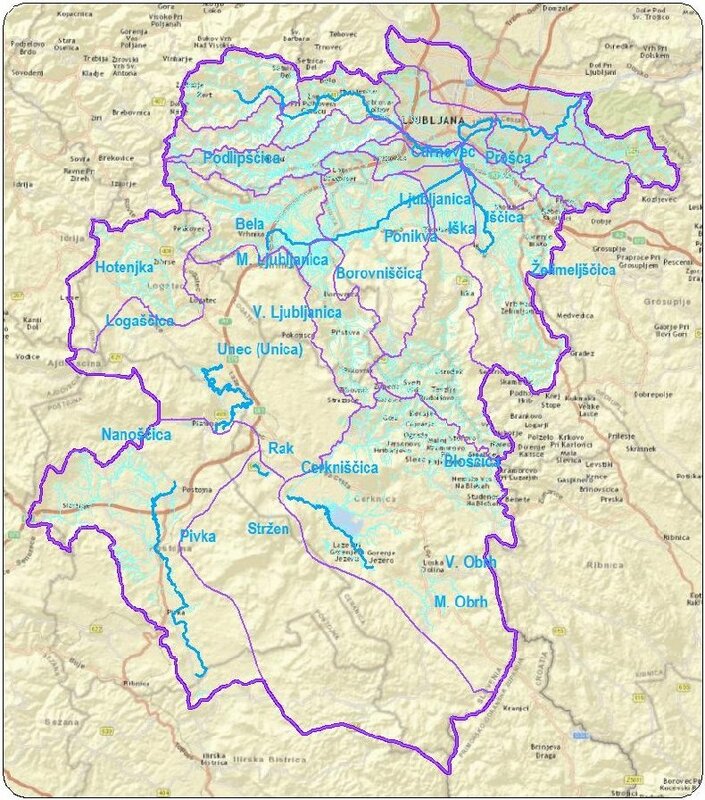 These rivers are the reason why the water regime of the Ljubljanica is partly torrential. In its upper half, the river undulates through the flat Ljubljana Marshes, keeping the flow slow and steady. The water flows slowly in the several-metre-deep channel, forming a water body with a volume of more than three million cubic metres. The bulk of the Marshes is underlain by an artesian aquifer in which the pressures exceed the surface terrain and keep the poorly consolidated surface layers of the lacustrine silt deposits (called 'polžarica') in a delicate balance, which is maintained through the gates on the Grubar Canal and on the Ljubljanica at the Ambrose Square. In the Ljubljana Marshes, water is the element that is either too abundant or too scarce, which is rather successfully regulated by the barrier. Surface water and groundwater in the Ljubljana Marshes form a complex and sensitive environment associated with subsidence, which in places exceeds a centimetre per year. The subsidence of the marsh surface is the reason why the drainage measures derived in the past did not give the desired results, which largely prevented intensive exploitation and settlement. To optimize the gates' operation, a complex hydrological and hydraulic model will be built. The Ljubljanica riverbed is one of the most important archaeological sites in Slovenia. At the bottom of the river bed, artefacts dating back to different periods are found, i.e. from prehistoric to modern times. Due to its archaeological value, the river Ljubljanica has been protected as a cultural monument since 2003. The diverse hydrological water regime on the Ljubljana Marshes enables the maintenance of a distinct ecological system with high biodiversity protected by, and subject to, marshy lands. Part of the Marshes is protected by Natura 2000. To improve the ecological status in the Natura 2000 Ljubljana Marshes area, it is necessary to ensure the passage on the Ljubljanica for endangered fish species, particularly for Danube Salmon, Danube Roach and Striped Chub.